Courtesy New Museum, New York. 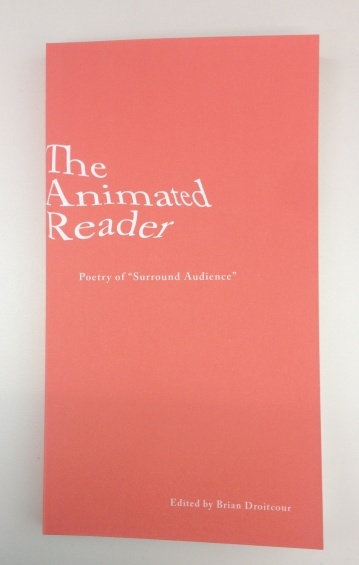 In conjunction with the Triennial, the New Museum and McNally Jackson copublished The Animated Reader: Poetry of Surround Audience, an anthology of poetry edited by writer Brian Droitcour. Featuring works, including original translations, by over one hundred international poets, and interwoven with transcriptions of social media statuses of many varieties, The Animated Reader: Poetry of Surround Audience offers an expansion of the Triennial’s themes of technology and identity through the medium of poetry. Anthology contributors Yan Jun, Wayne Koestenbaum, Cory Tamler, and Mónica de la Torre will give readings, and the event will be moderated by Brian Droitcour.